Katayanagi-so is a shrine lodge featuring family-style cooking and hospitality, located a two-minute walk from the Visitor Center. 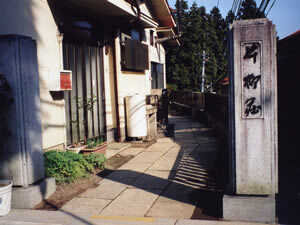 Katayanagi-so is an eight-minute walk from Mitakesan Station on the cable car line and a two-minute walk from the Visitor Center. The beautiful flowers change along with the seasons, and the fall leaves are stunning. 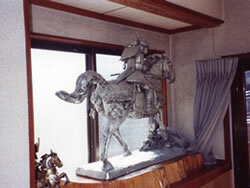 A statue of Hatakeyama Shigetaka atop a horse sculpted by Seibo Kitamura greets all who enter. From their rooms, guests can see houses with thatch roofs. 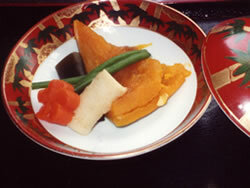 Katayanagi’s original cuisine awaits all who visit, and the dishes change along with the seasons. 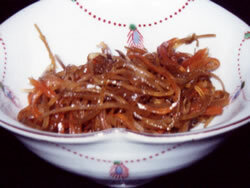 Palate-pleasing kinpira made by the Japanese grandma you never knew you had. Hearty dishes made with vegetables harvested from the fields of Mitakesan.